Communication between our back office here in Glengarriff and our retail outlets country wide means that reliability and consistent speed of service is critical to the success of our business here at Glenaran and DigitalForge delivers on that. 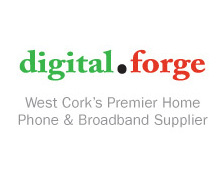 Digitalforge reaches out and connects rural Ireland with best-in-class ISP service. Reliable, fast and with the latest in technology my engineering consulting business would not be possible without it. Thank you DigitalForge! Having been a customer of two other national broadband providers in the past and suffered the frustrations and expense of both, I was highly impressed with the excellent service that DigitalForge offer. To be living in rural West Cork and have uninterrupted and constant download/upload speed is essential for my business to flourish. To be able to have all my devices connected to the net at once and not be worrying about additional fees if I am getting close to my monthly download limit is incredibly beneficial and reassuring. I can’t recommend DigitalForge highly enough. Thank you all.